There is a certain appeal to an indie movie set in the middle ages called Black Death. I hoped its independence and small budget might have spurred some creativity in the writing or in its approach to creating a far-gone world. There are some bright spots in this dark-ages tale. But it’s no Valhalla Rising or Mad Max. Do Osmund and Ulrick prosecute witches, or persecute them? Black Death is told through the eyes of Osmund (Eddie Redmayne), a young monk whose worldview is a little too big for the monastery. He harbors an illicit girlfriend and strong doubts about God. So he jumps at the first chance to leave the monastery. 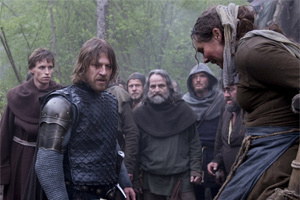 A band of soldiers led by Ulrick (Sean Bean) are on the Bishop’s errand. They are sent to investigate a necromancer’s tribe hiding out beyond a remote marsh. Rumor has it they have avoided the plague by practicing necromancy. Osmund says he grew up in that neighborhood and can lead the soldiers there. While traveling, Ulrick and Osmund discuss evil — whether it be God’s punishment, devilry, or the work of men. Are witches are persecuted, or are they prosecuted? Ulrick and Osmund probably disagree on the matter. Osmund brings his doubts, while Ulrick brings instruments of torture. They pass through the marsh and are welcomed at the peaceful yet odd village. The soldiers notice that the church is covered in dust, that the village elder is a woman, and that they don’t say grace before eating. Luckily, I was a little too quick to judge, although I still think it is fair to criticize Black Death for pitting two such exaggerated cultures against each other. By overselling the “untouched” and “peaceful” aspects of the tribe, I think my fears of a too-obvious metaphor were justified. Without saying too much, I can say that the audience is in the same boat as Osmund — not enraged by the fervor of God like Ulrick and his torturers — yet still in the dark about what exactly this remote village might hold. The tribe are not as two-dimensional as I feared. They are not purely peaceful, and they aren’t naïve. They know why the Christians are here, and they are ready for them. The movie includes a coda that shows us what happened to Osmund’s soul after the primary events in the film. But the jump is so jarring and the final scene so brief that I would have been more content without the coda, even if it sheds a little bit of light on what went before. I am also mildly disappointed in the tone and look of Black Death, which is directed by Christopher Smith, who directed the festival dark-horse favorite Severance. When Black Death is gruesome it is not action-movie tense, nor horror-movie fun, just dramatically horrible. And for a low-budget movie, it looks slick and well polished. Photogenic fog-machine fog banks, lit from behind, suggest the mists of time. But I was hoping for something dark and gritty. Even Monty Python and the Holy Grail conveyed a grimmer, filthier dark ages than this.